I will be hosting a free car wash on Saturday, August 8th at Pep Boys in Orem on State Street (Look right for more information). For those who haven't registered to vote yet, the only cost will be to register (which is free)!! I will be giving out a free yard sign and bumper sticker to any donations over $5.00. All soaps used are 100% natural and biodegradable. 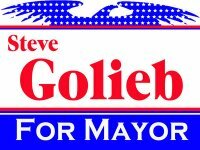 You can find my group by searching "Steve Golieb for Mayor" or by clicking here. You can also become a fan by searching for "Steve Golieb" or by clicking here. On August 13, 2009, there will be a "Meet the Candidates" meeting open to the public. Jerry Washburn, Steve Golieb, and Phil Hornberger will be the three candidates for mayor. Today, Lindsey Stallings, my official campaign photographer and designer, just created a bumper sticker for residents or businesses to show their support of my campaign. They will be printed next week. Today Steve Golieb met with Jim Westwater, chair of Utah Valley Sierra Forum, and attended their monthly meeting in the Provo City Library. Steve gave a brief speech on what he plans to do if elected as Mayor. Today, Lindsey Stallings, my official campaign photographer and designer, just created a yard sign for residents to show their support of my campaign. The yard signs will be printed within the next one to two weeks. I will keep you posted! An official account has been set up for my campaign. All donations can be made online through credit/debit card, or you can visit my "Donate" page for alternative methods of donating or other ways you can help. 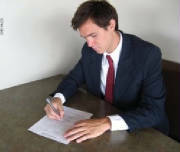 Officially a Candidate for Mayor!